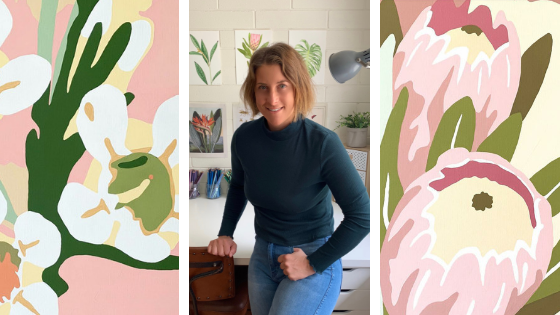 A collection of artworks featuring Australian native flora using colour palettes inspired by the Australian bushlands, deserts and coastlines. The contrasts of the Australian native flora’s intricate details and the bold yet calming colours of the Australian landscape are fused together. Each artworks colour palette is directly related to the landscape where the species are most commonly found. This collection of Australian natives will fill their new homes with the peaceful colours of the Australian landscape and the beauty of the Australian native flora. Living and working on a sheep and cattle property in rural South Australia I am constantly inspired by all thing’s country, landscapes and nature, both flora and fauna. Working through the seasons has brought an understanding and appreciation of change and cycles. I use this flow through the changing colours and energies to inspire my seasonal collections. The Australian bold yet calming landscapes, unique flora and country lifestyle are at the heart of most artworks. Kim Haines Creations, the brand grew from an initial love of botanicals and their intricate beauty. Australian natives are the most frequent muses, but exotic flora also bring a fresh change at times, inspiring other collections of work. I set out to create artworks that would enhance your living space with fresh, vibrant and bold botanical and nature inspired pieces. With each artwork comes a sense of peace and home, from me to you.